للمسافرين الذين يرغبون أن يعيشو كل ما تقدمه نادي, فندق تانوا إنترناشونال هو الخيار الأمثل. يمكن من هنا للضيوف الاستمتاع بسهولة الوصول إلى كل ما تقدمه هذه المدينة النابضة بالحياة. يشكل هذا الفندق ملاذاَ مريحاً للاسترخاء ويمنح زواره فرصة للاستجمام والتجدد، وهو يقع على بعد خطوات من المعالم السياحية الكثيرة للمدينة كمثل: روزي هوليديز, مطار نادى الدولى, نادي ايربورت. استمتع بالخدمات الراقية والضيافة التي لا مثيل لها بهذا الفندق في نادي. إن خدمة الغرف على مدار الساعة, مكتب الاستقبال على مدار الساعة, مرافق مخصصة لذوي الاحتياجات الخاصة, تسجيل وصول/خروج سريع, تخزين الأمتعة هي جزء فقط من الخدمات التي تميز فندق تانوا إنترناشونال عن باقي الفنادق في المدينة. في الفندق غرف نوم يتجاوز عددها 148، كلها مجهزة بعناية وجمال وبعضها مزود بـ تلفزيون بشاشة مسطحة, اتصال لاسلكي بالإنترنت, غرف لغير المدخنين, مكيف هواء, تدفئة. كما أن مجموعة الخدمات الواسعة الموجودة في الفندق لضمان راحتك تترك لك الكثير من الخيارات لقضاء وقتك أثناء فترة إقامتك. يحظى فندق فندق تانوا إنترناشونال بموقع ممتاز وخدمات يصعب منافستها. UNDEPENDABLE WIFI: The WiFi often lagged or was unable to connect. This was difficult to get work done. NOT ALL STAFF MEMBERS FRIENDLY: A few of the receptionists were friendly, but not all. Some were very curt or unable to put in effort to address issues. A simple friendly smile can go a long way. The tour desk lady was especially unhelpful when she learned I booked several packages at the airport when I landed. It appeared she felt less than motivated to help me resolve issues since the commission already went to a tour staff member at the airport. It was frustrating because even though the hotel tour desk is supposed to help guests (one of my tour packages forgot to pick me up with the bus one morning), this was not the case. Customer service training is highly needed. Rooms really basic for a steep price Food is good Check-in: lady want to charge my room again, even I prepaid (said I would have booked one room with Expedia) - not correct 1h later another lady at the reception said all is ok (suddenly). Location is handy to airport, shops & places to eat in Namaka. Good place to stay for transit purposes. Great pool area & staff are friendly. Free breakfast offers some choices & serves it purpose. Air con in our room was not cool enough. Called reception & was told someone was coming to look at it on 2 occasions but nobody turned up. Overall, I was happy with the hotel & would stay again. Nicely designed, very reasonably priced, clean, modern room with brochures on ordering room service meals and telephone information easily visible on my room desk. Staff were all courteous and helpful. I was able to take the hotel courtesy van both to and from the airport. There was no bottled drinking water in my room so I was thankful I had brought my own drinking water. I was very satisfied with my stay and will stay there again next time! We are glad that you enjoy your stay . Looking forward to your next stay. You expect things to be working when you ignore the cheaper hotels. I got late to a morning meeting because they booked me in a room with a broken shower. I had submitted a written review but no one has gotten back to me. It has been 3 weeks now. We stayed for 1 night before our early flight to Sydney. Staff were efficient, room was clean and comfortable. We had a meal in the restaurant which was tasty. We took advantage of the free airport transfer bus which only took 5 minutes to get to the airport. 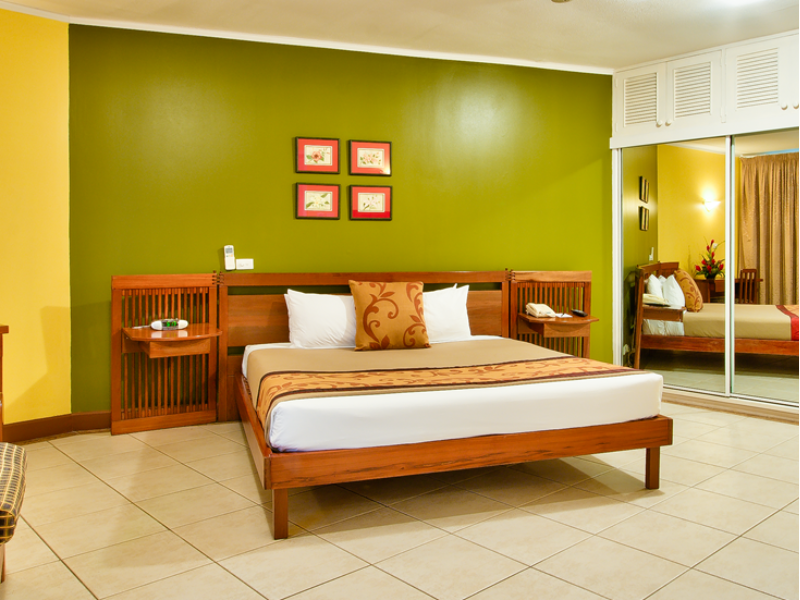 I stayed at the Tanoa International two nights on two seperate occasions and had two different rooms. Both rooms were adequate. The beds quite hard, with lots of pillows and I slept well both nights. The decor was fijian themed but dated. The bathrooms, although clean, are in need of renovation. Room service was prompt and all staff welcoming and helpful. The pool/restuarant/bar area is well laid out and surrounded with pleasant, well maintained gardens. The hotel is strategically located close to the airport and have all the facilities you might need for a nice night. Breakfast is excellent. The restaurant is good, but the service is completely disorganised to say the least. They upgraded us for free which was awesome but staff never seemed to smile much besides the one guy who took our bags to the room along with the other one guy who served our dinner that one night. Overall our room was nice and clean, my cousins room had cockroaches but they can include that in their review. Stayed here overnight after flying in late at night and leaving early the next morning. Shuttle from airport was super easy, dinner was great and rooms were clean and comfortable with air conditioning. Things got a bit noisy during the early morning though as people were leaving for flights etc. If you're a light sleeper you might want earplugs. The rooms could use a huge upgrade. The bed linen and curtains were stained or torn. The bathroom tile was a bit grimy. The walls and door had stains as well. But overall I was glad to stay there. The staff was awesome. 24 hr room service was perfect. The dining area was beautiful. I would stay here again. And my money went longways there. Electricity was out for twice which was weird, Japanese restaurant inside was quite nice & authentic, pool was small, room was good & mattress a bit soft, environment around hotel was a bit wild, suggest not going out @ night. Besides, there is an IGA supermarket around, you can buy some snacks if you are not satisfied with food in hotel. Staff, wood fire pizzas and tour desk. Fantastic, staff very accommodating and friendly. My partner and I were very impressed at how much the staff seemed to care about your stay. The tour desk operators are first class in organising activities and transfers to our next destination in Fiji. Highly recommend if your looking for a place to stay near nadi. 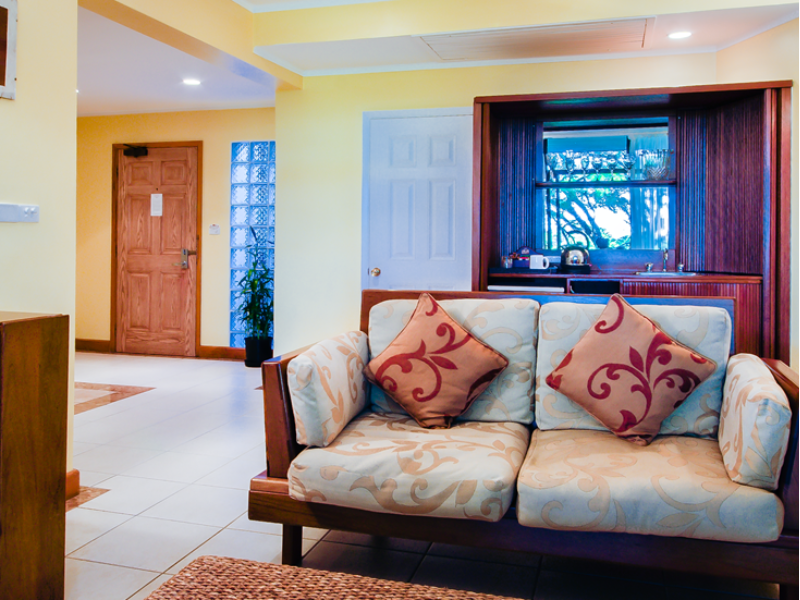 Very nice place to start your Fiji holiday, beautiful gardens all around, well equipped gym, airport transfer, beautifully designed room with bath and balcony. Loved my stay there and would recommend it to everybody.